A few months ago I met Kristi Pfliger-Keller at a Funky Junk class through BSC Continuing Ed. Kristi was the teacher. It was a blast to hear about ideas of repurposing junk and finding funky uses for old things. One of her sayings is “Rust is a Color too.” I immediately liked Kristi. She has such a positive, go-for it attitude and a passion for funky junk. I have since connected with her a few different times. Kristi started a funky store last fall on Main Street in Mandan. She loves funky, old, interesting items. It is a fun passion of hers, so she decided to open a store. She loves old trunks and so Traveling Trunk was born. I love that the store is only open Fridays and Saturdays. I love that every time you go in to her store, you find many unique and different things. I love that her husband and son also enjoy her passion. In the interest of full disclosure, I have recently consigned a few items in her store. Items that I have found in my treasure hunts. However, even before I did that, I loved her store. About a month ago I bought an adorable white table that I have in my entryway from her store. I plan to change its color and when I do, I will post a photo. So if you live near the Mandan area, go check out her store. You are sure to find a unique or treasured item that brings back a memory or two. 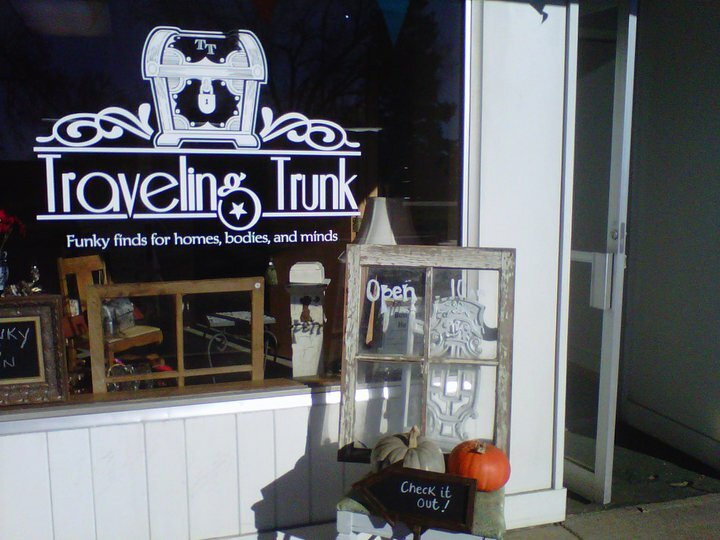 Traveling Trunk has a facebook page where Kristi posts photos of fun finds for sale. Check it and the store out.